Eating your water is an easy and healthy way for your whole family to maintain hydration so we’ve got 15 healthy recipes featuring super hydrating foods. 1. 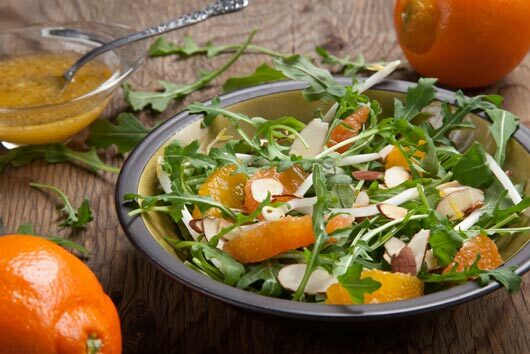 Mixed Baby Greens Salad with Mandarin Oranges A gorgeous salad that’s a hydration bonanza since almost every ingredient is 80-90% water. 2. 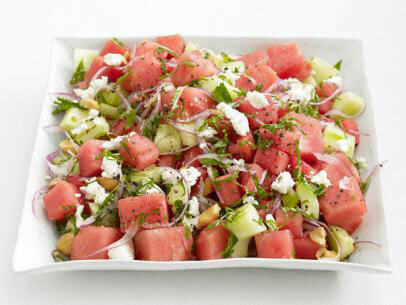 Watermelon Cucumber Salad There’s a reason it’s called watermelon — our favorite summer treat is over 90% water. Cucumbers are one of the most hydrating veggies at 95% water. This delicious, nutritious salad is seasoned with onions and mint then topped with cashews and goat cheese. 3. Minty Yogurt Parfaits These are actually savory yogurt parfaits, totally portable and perfect for a light meal. Beans, yogurt and cucumber provide water, protein, fiber and calcium. This is truly a power lunch. 4. Butternut Squash & Egg Salad Who knew butternut squash was almost 90% water? 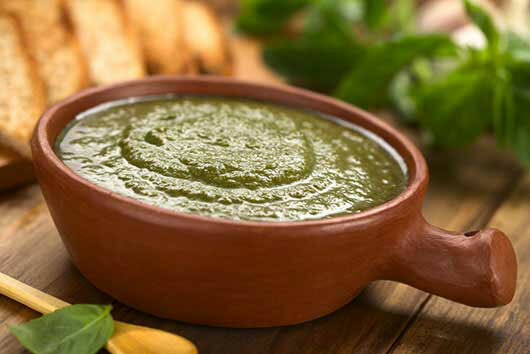 It’s also an excellent source of vitamin A, magnesium and fiber. With protein from the eggs, this dish is a winner. 5. Cauliflower Steaks with Ginger, Turmeric and Cumin Cauliflower is over 90% water and has tons of fiber, vitamins and phytonutrients. Turmeric is a powerful antioxidant and if you serve it over a bed of supergrain , quinoa it’s almost too delicious and healthy. 6. Silly Apple Bites These may be the most adorable snacks ever! They’re healthy and no kid could possibly turn down this hydrating fruit snack. 7. 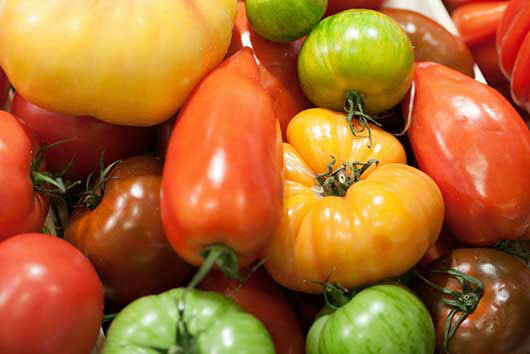 Tomatoes Tomatoes are over 90% water, they’ve got lycopene, another fabulous antioxidant, and the elusive umami taste. These three recipes for Heirloom Tomato & Toast Salad, Grilled Tomatoes with Cilantro-Lime Crema and Tomato Sorbet-Cicles cover every course. 8. 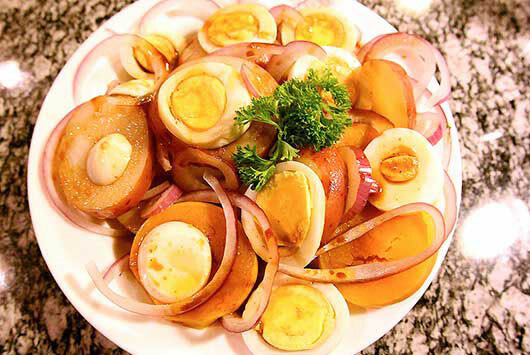 Roasted Radishes & Carrots with Turmeric We’re used to raw radishes but roasted is a whole new taste and texture experience. Radishes and carrots are both great for hydration and turmeric adds oodles of flavor and antioxidants. 9. Protein Packed Spinach & Red Rice Pesto Spinach, asparagus and yogurt provide the water; red rice and cashews add protein. Now this is how to stay hydrated in style. 10. Tuna Salad Celery Logs Celery is super low-cal but that doesn’t mean it’s not full of vitamin goodness. Tuna Salad Celery Logs make a fantastic light lunch or snack for the kids. 11. Tropical Fruit Smoothie It’s a tasty tropical treat that gives you a healthy dose of water, fiber and beta-carotene, which is fantastic for your skin and eyes as well as warding off cancer. 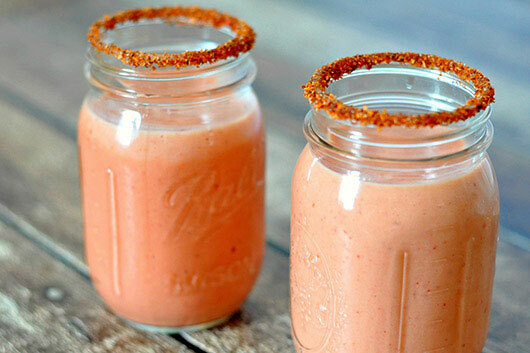 Tajín Clásico gives it a dash of spice. 12. Spicy Eggplant Spicy Eggplant is a hearty main dish with a zesty Asian-inspired flavor. 13. 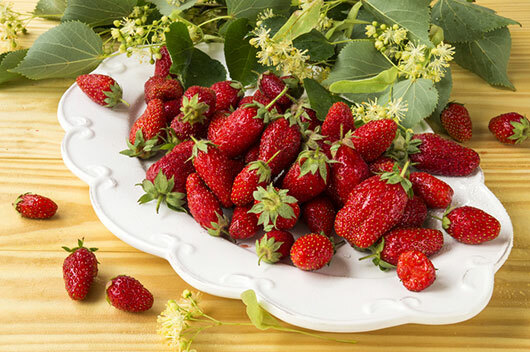 Strawberries Strawberries are not only delicious, they’re loaded with vitamin C. Try these awesome recipes for Macerated Strawberries, Strawberry Calfoutis and Fresh Summer Salad with Strawberry Dressing. 14. Mixed Berry Parfait Rediscover Jell-O as a guilt-free dessert. It’s low-cal and hydrating! 15. Simple Black Bean Soup Nothing’s better on a cool day than a hot bowl of black bean soup. Beans, tomatoes and bell peppers make it thirst-quenching too. my best friend’s step-sister makes $88 every hour on the laptop . She has been fired for 5 months but last month her payment was $21446 just working on the laptop for a few hours.